I assume my crab died. He was upside down yesterday and didn’t move that much. He would flip back onto his back if he was flipped over and also moved every so often. This morning he was moving but when my friends came over a few minutes later he wouldn’t respond. He is upside down with his belly/stomach opened up. Any suggestions on what may have happened? Or is he just dead. <No such thing as a freshwater Fiddler Crab; they're all brackish to marine. So this may well be why it's dead. 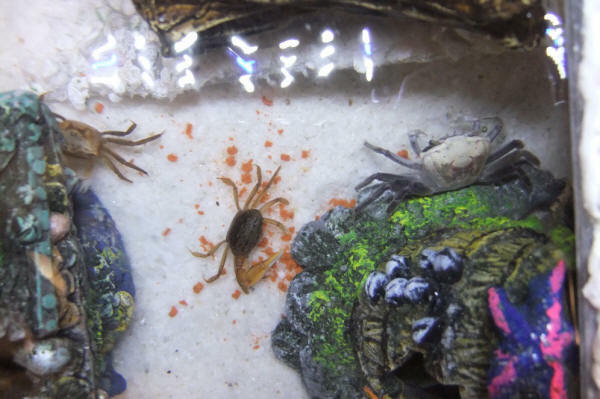 Wal-Mart, and other retailers, are in the habit of selling these crabs as 'freshwater' crabs because that tricks inexperienced fishkeepers into thinking they're easier to keep. A secure tank, shallow brackish water pool, humidity, plus an under tank heater or heat lamp are what you need. Think pet frogs, but with brackish water and a diet based on plants and bit of seafood, and you're all set. I have a 20 gallon glass aquarium. I live in an apartment and I'm allowed a 20 gallon vivarium/paludarium or a 10 gallon aquatic tank. I'm interested in information about Fiddler or Red Clawed crabs. All I know is that you need 1/2 play sand & 1/2 dechlorinated 1.010 salt water, and rocks for them to climb. I have tried to read the articles on brackish water, but I'm having a problem understanding how to set up the tank, dietary needs, etc. We got them about 6 months ago from Wal-Mart, and I put them in my 10 gal freshwater tank. I did not realize how aggressive they were, and after they ate 3 of my tetras, we put them in a 10 gal tank. The tank had about 2 inches of water, half sand, and some rocks and shells. I fed the crabs fish food, some small bits of fruits and pieces of fish, such as tuna or sockeye salmon. The crabs both molted several times and got along for the most part. This morning both of the crabs were flipped upside down! 1 seems dead and 1 is still moving a bit, what happened?! what can I do? I just read about the crabs needing salt, so I put a tiny bit of aquarium salt by them. Yes, the tank is half a sand beach, and they can climb the rocks to get out of the water too. We got them after feeling sorry for them at Wal-Mart, but have become quite attached, especially for their "waving" antics. I did not know anything about crabs really. Shortly after adding the salt, they both perked up, flipped over, and started traveling around. It was amazing. Most of the posts on your site has things about crabs needing salt. <Mmm; a bunch to state here; but no doubt orders of magnitude more organisms are killed by mis-use of salts (combinations of metals and non-metals) than aided. How much salt is in your source water? Many organisms need "some", but very few are aided by more being added blindly. re: two fiddler crabs flipped over..
Oh I cleaned their tank etc as well. I know you live "overseas" ~ just curious if you were close to Southampton at all....my brother took a job as a percussionist on Cunard's Queen Mary 2 and their major ports are New York and Southampton, so he is there quite often. He has also been to Oslo, Hamburg, Le Havre, Bruges, and a bunch of other places all over Europe. Regarding my Fiddler experiences, well, I've gone through ups and downs. I've lost a few over time. I have come to realize it isn't anything I am doing incorrectly. Some it seems it was most likely their time as they were over a year old. One seemed to pass away because she couldn't molt, just as one boy passed right after he molted. Some seemed fine and then passed away seemingly out of nowhere. Some of them passed in pairs (a male would pass and then the next day a female passed in the exact same spot as he had - and they had been a "pair"). <Indeed. Fiddlers probably aren't all that long lived to begin with, a couple years probably, and the ones seen in pet stores are presumably around a year old when they get them, since the larvae take the best part of a year to complete their maturation process into actual crabs. So yes, once you buy them, you're probably going to keep them for 1-2 years, tops. Right now I have six, two boys and four girls. One of my girls I got from Petco, not realizing she only had two legs on one side and one leg on the other.....I was VERY worried about her when I got her home but decided I would keep her because she would die if I took her back. In the tank one of my more shy females took a liking to her and allowed her to hide in her special spot. I must say she was a feisty little thing, even with her three legs she was not going to take anything from anyone!!!! Within two days of me getting her - she molted and got all of her legs back, except for one!!! She has kept up her feisty spirit though! I have another cute female who will sit by the glass close to me and if I put my finger close to her, she will put her little claws up in "fighting mode". It is too cute. I've had a few pregnant females but for the most part, not too many. I had one male who was relatively aggressive but he passed away (the one who tried to molt or was ready to and didn't....). Since then I have one larger male and one smaller male and they are not too aggressive overall. The tank is still a pain to clean since they love their sand. But with the Plexi-glass thing I devised, it is much easier to clean. My friend gave me fiddler crabs, said they were easy. A week later they died. That’s when I actually looked up how to care for them. Spent a lot of money on different habitat space, (takes a lot of rocks to have a filter and land). Bought two red claws, week later they died. Did more reading/research added a sand substrate, made sure environment was consistent for a couple of weeks, then added 2 more red claws. they were fighting on the way home. old my husband to dispose of it but he asked what was I talking about it was moving. It stays in same land cave all day barley moving. I assume it’s preparing to molt. Every morning I’m sure its dead and then it gives another slight movement and is occasionally bubbling at the mouth(for breathing I’ve read?). However, today It is upside down, but is still slightly moving. I’m leaving it alone because I read to not bother it during molt. There is little information anywhere on the molting process or behavior. Is this crab going to make it or is it like a bad movie with a long drawn out death scene? What can I do, if anything to help? It’s been 3 days of this behavior is it going to make it? Any help would be wonderful. These pets are cool but have had me worried and stressed out for weeks! I told my son this was the last try then he can have a fish. Well, no news on the crab end is good news right? I think you have a bit to learn about these little creatures. I know you are the expert and have told me they don't mourn and they aren't all that social. However, I swear the larger female left from my other group of four mourned the loss of her other female mate, as she did not want anything to do with the two new babies. And the two new babies paired up and were stuck like glue to one another - that is until.......the new little female molted. At that point, she wanted to be left alone for a bit. She lost a leg in the molt and didn't want anything to do with the male. She just wanted to hide out under one of the ornaments. What happened next was quite interesting....the male seemed frustrated, so what he did was he decided he was going to play with the larger female. Now, Ms. Stepsister/Mistress got quite annoyed by the Little Prince...to begin with. He started by following her around the tank little a little puppy. She kept going away from him. Finally at some point, she started to let him get closer. He got close enough to touch her with his claws and then she would run away. He would then follow her, touch her with his claws, and she would run away. This happened for awhile. Finally, he decided to stop and went away. She must have decided she missed having someone around or that she didn't mind him after all, because she went and found him and touched him with her claws and ran away. He realized she did this and so she went back after her and they started this game of "touch the claw" almost like "tag" with back and forth - she would come find him and touch his claws and play with him and then run and he would go find her climb on top of her or touch her claws, and run off. This went on for hours!!!! Each would lie in wait after they ran away to see if the other would come and if the other didn't come fast enough, the other would go back after the other one again to remind the one they were still playing. It was hilarious. Ever since that day now, whenever the Little Prince does his waving stuff, she will come by him. I think the little female get a bit jealous sometimes because she will come in and resume her place as if to say....."wait a minute....he's mine honey....." So, the good thing out of it is the older female has come out of mourning and is back to going around the tank rather than hiding all the time. The three of them overall seem to be doing well, with the exception of some slight jealously between the little female and the older female......but is only slight jealously when the older female pays attention to the male. In some other bad news, both my Pittie and my oldest cat Kissy (a Sphynx hairless) have mast cell cancer tumors. So that has been stressful for our home. Monetarily it was bad when I found out my Pittie had it...but then I found out my cat had it just today. Additionally we had been waiting on some results to find out if my mom had cancer but luckily her results were negative!!!! Anyway, I wanted to let you know how things were in our crabby world and how things were going. I know some of it goes against what you tell me about them but their actions are just strange and how they seemed to enjoy playing with one another. I enjoyed watching them, that's for sure. They were just too darn cute they way they ran back and forth. It really looked like a game of "tag.....you're it....no....tag...you're it......" haha. Recently after the girls molted, I realized the crab who passed away was not the one I thought, but was actually Mrs. Crabby....the "mate" who was purchased for Mr. Crabby and had been with him since the beginning - AND - the one he liked to mate with (literally) the most. As you know, he nearly had her constantly with eggs. When we got the mistresses, he would also mate with both of them - the larger female more often than the smaller female, but he would mate with both of them as many times I had all three females carrying eggs. However, since the passing, of what I know now to be Mrs. Crabby, Mr. Crabby has not mated with either of the mistresses!!!!! I have not had any females with eggs at all!!!! What is up with that??? Did he lose his "mojo"? I mean, he still does his little crabby man dance to show off. He actually does it a lot. Is it the girls who are somehow not allowing him to mate with them? It seems like they really didn't have a choice in the matter before. I really just don't get it!!!! Not that I am complaining mind you.....I just find it odd. You know one of my main things was having the girls with eggs, eggs, eggs, and more eggs. And now....NOTHING. It is so strange. <There's a vast literature on mate selection out there, and you may find some of the primers, like the excellent "King Solomon's Ring" worth a read. My assumption of course would be the human trait of him missing his mate and now that she is gone he won't mate with the others but it was okay when she was around. But I know you are going to tell me that is a human thing and the crabs aren't like that....so then what is it??? Anyway....in other news, I've had quite a few successful moltings in the past few months - at least one or two from the male, a few from each female - basically they are all the same size right now. It was interesting as after I did a tank cleaning, added my calcium, iodide, and fed them, two molted; then this past week, I had added a bit of water, fed them, added the calcium and iodide, my mom and I ran some errands and when we got home, one of the females molted. Normally they tend to molt overnight, but I added all this just before we left and we came home to a fresh molt. It definitely seems to help with the added supplements to the water. And those crabbies all love when I do a tank cleaning - they go nuts eating sand when they get back into their tank!!!! Seriously, I can't even see those girls claws move because they go so fast. I love watching them. It is funny to watch Mr. Crabby with the one claw shoving the sand in. I think they are also happy with the Plexi-glass set-up with more water. They all have areas to get away from one another if they want and have more hiding spaces than just the one spot - it has also helped for molting because they all used to go into the chest to molt and now they have molted all over the tank in the various "ornaments" I have for them. Well, anyway, let me know your thoughts on Mr. Crabby's seemingly change in hormones.....lol. Are the three of them okay the way they are and should I leave things alone? OR - should I add another female (or two)? Would that "rock the boat" too much, so to speak? I assume adding one more female (most likely of a smaller size) wouldn't be the best idea since all three are of the same size, so I would probably have to add two. Would this put a spark under Mr. Crabby again? AND - do I really want that? Since I have no other males in the tank, I assume he does his Crabby man dance for the girls. (Or does he have to move that big claw around for "exercise" to keep it mobile?) If he does it for the gals, then I assume he still is trying to impress the girls, but they are completely uninterested...haha. **One off-topic thing is I know you say iodine is good for these guys...and a friend of mine recently got hermit crabs....is iodine good for them as well and if so, how do you give it to them? their little girl wanting another one, so they got two more at a pet store the next day and the pet store sent them home with all the wrong stuff. Once I talked to them, they realized that, and the following day realized they needed to go back and get all sorts of new stuff and wound up spending over $100+.....all because of a carnival hermit crab. water/freshwater, climbing ornaments, multiple good shells, etc. what else I could tell them. As I said, I know the calcium and iodine are good for the Fiddlers, but does it help hermit crabs too? What other good info, if any, do you have? I know it is off base from the Fiddlers, but I figured I would ask quickly so they at least have a basic start. If you don't know much about them, that's fine too - I am not getting into hermit crabs any time soon myself :) I think they are cute and like them quite a bit, but the Fiddlers are such a learning curve for me and I don't think people realize how these little creatures have so much knowledge needed to adequately take care of them and give them a good life!!!! Especially when mall kiosks and carnivals have hermit crabs with all those fake painted shells - so not nice!!!! I meant to ask if you if you have a Facebook page of anything of that sort. Oh - and I know you talked about that article in Coral Magazine and I had found Part 1, but you had said that Part 2 should be in the next issue and when I looked, I didn't see the second part in the upcoming issue. Could you tell me if you found Part 2? Some bad news.....Mr. Crabby is no longer with us. He must have passed away sometime this past evening and I noticed a little while ago when I checked in on them that he was sitting in the middle of the water and it looked like he was not "standing" on some of his legs. I am not sure what happened. I can tell you a few things and perhaps you will say maybe it was this or that or none of the above. One was that recently he was trying to mate endlessly with the two girls and they were running away from him like crazy - trying to get away from him....as in trying to climb the filter cords, scurrying all over trying to hide, etc. Finally I went into the aquarium and made it easier for them to hide from him and gave them some food and watched them for a while as it seemed to get somewhat vicious a few times when he did manage to catch them and they got away from them. He gave up after a while and seemed to not be interested again since that day, which was about a week or so ago. Could me preventing him from mating or trying to prevent it (since he hadn't shown interest in forever and then he had and I stopped it) be a reason he died? The next thing that happened was the top glass part of the tank wound up breaking on me, by accident of course and in the meanwhile, I have used a piece of Plexiglas as a cover. The main difference between the glass and the cover is the glass had a U-shape in it for the screen cover for air to get in better, whereas the Plexiglas does not. Could the lack of that small bit of oxygen through the screen be a reason for his death somehow? The girls are both okay, as far as I know. The only other thing I could think of is possibly a small piece of glass could have gotten into the tank? But the glass top broke nearly a week ago as well, so I am not sure if that could be it. I guess I am trying to suggest all options to see if any are possibilities and what you suggest might may be the most likely for his death. Third, I told you he hadn't been acting the same since the death of Mrs. Crabby, and that was less than three months ago.....could that have anything to do with his passing finally? I clean the tank regularly, but I guess there is always a possibility that something in the tank could have killed him? Or perhaps could a large piece of food done it? I had just fed krill a day or so before. Could it have been a bad piece of krill? From all the looks of it, Mr. Crabby didn't look sick - he had all his limbs, his eyes were upright, his color looked good. He was probably about a year old or so - not really sure - I got him in about October or so of 2012. Could it just have been "his time"? Since he was bought from Wal-mart and therefore not given a good start off right from the beginning? My next question is - now I have two females...the two which were bought together. Do I just leave them be as a pair, if not, what do I add to the tank? I am going to wait until I get the new top for the tank replaced, which is going to cost me $60!!! I am also going to do a good scrub down of the tank tomorrow (since it is 3:30am here now) since he passed away in the water. Once that is done, it is kind of a large tank for just the two gals isn't it? Will they miss a boy or not? Do males just cause trouble...Hehehee? <The females are fine together. You could add some more, but I'd keep outnumbering males with females (1 m: 3 f, 2 m: 5 f, something like that). At first when I got them I took the two older girls out, put the new little ones in, fed them, and they were hungry as ever. I don't believe I have ever seen the crabs eat every morsel of food I gave!!!!!! Of course they poo'ed a lot too. Once they ate a bit I added my other girls back in - after I also had added more food as well. The one girl just went toward the back and didn't give the new ones any mind, but the other female insisted on trying to pick fights and chase after the little ones. So I was on crabbie watch for a while. Finally the older one gave up and I think it gave the little ones some courage too....haha. The next time the bigger one came around, the little male put his little claw up (which is about as big as the older girls small claws.....lol) and acted all tough. It was quite humorous. The little female also wasn't taking any "you know what" either. AND within probably an hour or so, the little Prince (well, if there are evil stepsisters.....there has to be a Prince right?) was trying to attempt the crabbie dance. He wasn't very coordinated yet with it, but he was trying. And he was trying when the girls came into sight even more. It was SO cute. I am debating getting a larger tank; however, that means more cleaning and I am such a neat freak and a larger tank means more difficult to clean - and more sand and more stuff to clean and all that jazz. So, we'll see. Okay, so now I am done with my boring story.....haha. I do have one question which I may have asked before.....as you can see in the picture - the two new crabbies are much brighter in color than my older girl. Usually they are that bright orangish color when I get them and change to the duller brownish color within a week or so. Does this have to do with them being kept completely underwater freshwater and then I put them into the brackish salt with access to land? Is it due to lack of diet at the store? I don't think they feed them all that much or at all - I know because whenever I buy them they come home and eat and eat and eat. Is it due to lack of moltings? Is it due to immaturity? I know the older gals have "hair on their legs" and the younger ones don't...so it is age-related somehow? I guess I am clueless as the change in color but it always happens. Sorry to hear you've had some difficult days - I hope nothing too major. Anything I can help with? You've helped me a lot, so if there is anything, let me know. I am a good listener and great advice giver - I just don't know much about these little crabbie creatures. My degrees (a Bachelor's and a Master's) are in Psychology, plus an MBA, and I went to medical school (but alas did not finish due to some extenuating circumstances) and I have recently started Life Coaching business :) My business came out of a lot of education and difficult years for me. Well, it seems the addition of the two little ones disturbed the Mistresses of the tank a bit much. I knew one (the larger one I purchased initially) was ready to molt and she seemed to be trying to find places to go but the little ones were bugging her. However, after the first day or so they all seemed to be getting along so I figured she would be fine. Well, needless to say, I decided to clean the tank a few days ago, and as I picked up the tank, I saw a leg and then she floated out from under the heater. As far as we know she was alive until just a few hours prior so we are not sure what happened exactly. Could it have been from not molting that caused her death? I know when I took out the leg which had fallen off, the outer shell crumbled in my hand and there was a leg in it - but it stunk horribly!!!! So, now I think the other older gal is ready to molt as she isn't looking so great. The tank also has an odd odor and I just cleaned it a few days ago. I am not sure what to do - if I should leave her alone and hope she molts or if I should do something to change things up? I didn't figure buying the new little ones would cause the one to die on me!!! That was the last thing I wanted!!!!! I feel just awful. I do use iodine supplement in the water - and I use it especially more often if I believe it is time to molt. The girl seemed to want to molt, attached is a picture of her belly separating. She was in the "chest" ornament for a few days prior to the new little ones which usually means it is time to molt. However, when we got the new little ones, every time she went into the chest after we got the little ones, they bothered her and she would leave the chest....or run from them. Basically they wouldn't leave her alone the first few nights. When she did get a moment to herself, she started to eat off some parts of her "mandible area". I figured after the first day or two when they all seemed to be getting along, she would go and molt but she never did and then she passed away. After she passed, I did a very thorough cleaning of the entire tank - scrubbed all the ornaments, etc. I always take the crabs out and have small habitats for them somewhat as you suggested - small plastic containers, some sand substrate on the bottom, some gravel just out of the water level, water about 1/2"-3/4" (same salinity as the water in the tank - warmed), an ornament for them to hide in or walk around in), and covered...although I usually cover with plastic wrap (with air holes poked in). Since the water is smelling again, even though I did the tank cleaning this past Saturday I will do a slight water change as you suggested and change the salinity a bit. I hope that helps. two females I had recently died one was trying to molt but wasn't able to the other I'm not certain. Please help I'm so worried about Crunchy. I purchased one male fiddler crab from Wal-Mart (kept in a Betta container) about a month and a half ago. Due to various information, I finally got him settled in a six gallon tank with half sand sloped down to water with a 50w heater in the water and a small submersible filter. The heater keeps the water at about 78-80 and the tank is the Fluval tank and keep in humidity well. I have a variety of hiding places (a small treasure chest, a bridge, a climbing turtle) which are in the water but stick out of the water as well. On the sand, I have a large log-like structure for hiding or crawling on/through. I fed him shrimp pellets and he seemed to like eating the sand as well as the pellets. Everything went well for the first two weeks but then he seemed to get bored. I had been looking for a female for him and found one at Petco. She was kept fully underwater in a freshwater tank. Since I had been checking frequently, I believe I got her within a day or so of them getting her. Upon bringing her home and introducing her to my male, his initial reaction was to stop and stare at her but then he started to show off for her and has seemed happier ever since. My first question is in regard to getting them switched from freshwater to saltwater/brackish water. I have been using distilled water right now and they are doing well. I know I am supposed to use some form of saltwater, but have no clue how to switch them over. I have been told not to just add salt as they could die due to the way they breathe in freshwater vs. saltwater. Someone told me to make sure to do the switch very slowly but I am not sure how slowly to do this. Second, I have had the male for a month and a half, the female for about a month. Neither have molted. Is this normal? Third, my male has been putting one eye down when he comes out of the water the past few days. He does put it up when he is in the water, but not completely straight up. Does he have a problem with his eye that I can do something about or is this a sign of something else wrong? Fourth, I have tried to feed them other food - Hikari crab cuisine, crab pellets, etc. with extra calcium, but they seem to only like the shrimp pellets. Should I try other things or is feeding just the shrimp pellets enough? Fifth, even with the sand substrate they do not dig or tunnel, as I have read some like to do..is it normal for them not to do so or do I have the sand packed too tight? Sixth, do they like change, i.e. changing up the decorations in their habitat, or do they not care, or do they like things the same? Finally, even with the filter, the water seems to get cloudy within a day or so. Is this normal? I feel like I should be changing the water all the time to keep the water clear - as the female seems to not like to go in the water as much when the water is dirty. Additionally, there seems to be more smell, despite me trying to keep things clean. Any advice? Sorry for the length of the email, but there is just so little information out there, let alone good and valid information!!! 1. I have added some salt to their water so that it is about SG 1.004 to 1.005. I purchased marine aquarium salt from Petco. When I went there, the employee suggested regular aquarium salt, but I said your suggestion was marine aquarium salt so that is what I wanted. The employee told me the regular was cheaper and would work just as well but I said I wanted to do things right!!! 2. Neither have molted yet, but I am not worrying too much. The only reason I would like the male to molt is because when I purchased him he was missing one limb and so I would like him to regrow that!!! 3. I bought Sushi Nori and Krill. The Sushi Nori didn’t go over so well with either of them. However, the krill went over fabulously!!! They both LOVE it. The first time my male came into contact with it, he treated it as an enemy with his large claw up. My female, well, every time krill is put in the tank, wherever she is, she will slowly move, eating sand along the way, acting as if she is doing nothing at all, and sometimes it will take her 15 minutes to get to the krill, but once she gets to it, she grabs it and runs to her hiding spot in under the chest in the water. It is hilarious! 4. I tried to loosen up the sand for them to maybe make some digging areas, but they seemed to hate the loosened sand, so I packed it down again. I think they didn’t like getting it all over themselves, or so it seemed. Oh well. 5. The male’s eye seems to be better in the water and on land. I guess the brackish/salt water thing worked? Yay! 1. Now that the water is brackish/salty, they seem to both spend almost all their time in the water. I made sure to create a half-half land water situation but no matter what, every time I look, they are in the water. The only time they come out is to sit on the chest or if I put krill on the sand, they will come out to get it. 2. After going through numerous filters, I finally decided on a sponge type filter. However, it wasn’t doing the best job. A Petco employee suggested purchasing mesh bags and loose carbon/Zeolite blend instead of the sponge. I did this and it did wonders for the water as far as keeping the smell down to a minimum and keeping the water clear. However, on the second change of this mesh baggie/filter media combination something must have happened because I noticed the sand started turning a grayish color. Upon removal of the mesh baggie, I assume there was a tear or something as the baggie was blackened. My question is - (a) should I be using this mesh baggie/filter media thing in the first place? (b) do I need to do a total sand change because of the carbon “leakage”, since the crabs eat the sand? I have made sure to put a fresh covering of sand in since this happened but obviously the sand shifts and such, and I don’t want anything to happen so I will do what I need to do if the sand (carbon) is dangerous…. 3. You mentioned to not overcrowd them. Do you mean as far as with “ornaments”? I have since taken out a few things. One of my fears is the male will not have an area to molt since I read they molt in water and have watched a video of them molting (it looks horrible!). Should I give them back more water space and less land since they seem to enjoy water more? 4. Is it typical for the male to do his waving the claw thing for hours on end all the time every day? He didn’t do at all until I got the female and now he seems to do it (especially with the water clear) every time I look at him. On the chest, in the water, out of the water, under the bridge, on the bridge, in the chest, under the filter, sitting on the heater, you name it! It seems like that claw would be difficult to lift since it is as big as he is or would be tiresome! Sorry for the questions again. I appreciate all your answers to my previous questions. You helped me and my Mr. and Mrs. Crabby so much! Additionally your information provided quite a few laughs for me, especially when I watch Mrs. Crabby sneak up on her krill for 20 minutes only to run away with it and hide. Your information prompted a few more questions. 1. I assume you are not from the U.S. as it took me forever to find the Eheim Aquaball! To be sure, I wanted to ask, is this the one you are referring to? http://www.freshmarine.com/eheim-aquaball-2206.html It seems to be small and not too expensive. Which would you suggest to use with it? I have found these two things on that site as well.... http://www.freshmarine.com/aquarium-eh2615060.html and http://www.freshmarine.com/aquarium-eh2510021.html. 2. Banana - no go! Is there anything NOT to give them? I have read about zucchini and then you mentioned the fish bone and banana. I know they are "bottom feeders". I guess I was just wondering if there were things that is bad for them of if I can try other fruits and veggies...meats...etc? 3. I did wind up changing the sand, not on purpose but because I was taking out excess food and started to realize the sand smelled. 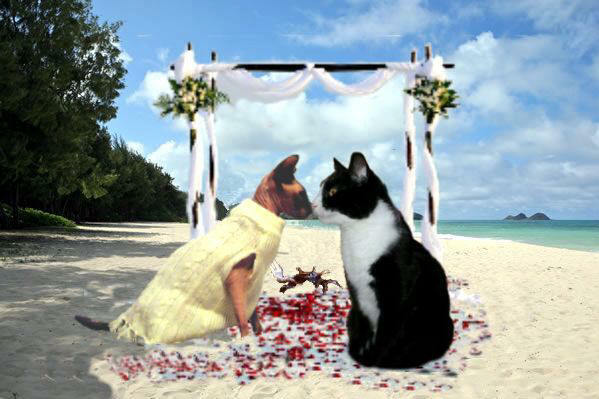 I figured it had been about two months or so since I had Mr. and Mrs. so since I had the sand, I wound up changing it. I also guessed it wouldn't be a bad idea since I had done the water change and such. Do you have any recommendations as far as how often to do a total change of substrate? All I can add to this is how thrilled the Mr. and Mrs. seemed with new sand...they went nuts eating the new sand forever! I assume the new sand (I purchase a reptile/crab sand) had some good calcium in it or something. 4. You mentioned supplemental iodine. What foods have iodine that I could feed? Otherwise, what would be a way to ensure they are getting iodine if not by eating it? 1. The humidity in the tank - I am not 100% certain; however, I keep the tank about 80 degrees F. Our house is about 68-70 degrees F. The tank is always "frosted" or "watered up" so I would assume it is humid in there. I am always wiping away the excess water build up so that I can see them in there. The tank I have is actually completely enclosed in glass with a smaller opening which has a vented area. 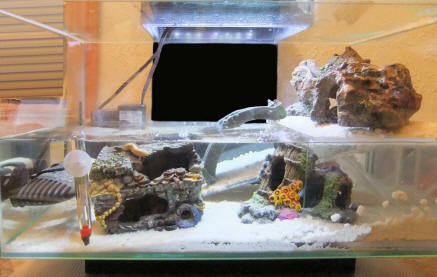 It is the Fluval Edge http://www.petco.com/product/117230/Fluval-Edge-Aquarium-Kit-in-White.aspx?CoreCat=OnSiteSearch. 2. I only plan on having two crabs for now in the tank so no chance for overcrowding. The reason being the tank size. The tank is only about six gallons. I figured this was okay for two crabs? They seem to be fine with each other space-wise. 1. How did you become a Fiddler crab "expert"? I was fascinated by crabs since a child (I am a cancer, born in June). Always loved hermit crabs but was never allowed to get one. I lived in Grand Cayman for a while and when I would go for walks, I saved quite a few hermit crabs as they crossed the road. I also saw lots of other crabs on the island and they were so adorable. I never saw little crabs such as the Fiddler crabs until seeing them at our local Wal-Mart. I fell in love immediately. Something about them was just too cute. My mom was with me and I am living with her right now, but since I am a 34 year old, she couldn't do much about it when I said I wanted to buy one! She's fallen in love with them and their mannerisms now as well. Even a woman she knows in Scotland who said she didn't like crabs because they looked like spiders and wouldn't watch a video my mom had sent has now watched a video and is in love with our Mr. and Mrs. Crabby!!! 2. I wanted to let you know that because of my experiences here with the Fiddler crabs and Wal-Mart, I actually got our local Wal-Mart store to stop selling the Fiddler crabs. My first experience with the crabs was a cute little guy I found there and he died shortly after purchasing him. I thought maybe loneliness or me not knowing enough. So I purchased a large terrarium set-up and spend a bunch of money and purchased four males and four females from Wal-Mart...still not realizing the conditions of how Wal-Mart was keeping them. All eight of the crabs died within a few days. The worst was a large male which I stayed up all night with, cried with, as he lost his limbs, and I tried to hand feed him and put him in the water and out of the water all night long. Each time it seemed as though he passed, I would put him close to my face, and his eyes would pop up and look at me as if to say, "not yet, I'm not ready yet." It was so sad. He carried on for about 16 hours like this. It was heart-breaking for me. When I went to Wal-Mart they wanted the crabs to "dispose" of them. I told them they could not have them because they did not go through what I did with them and I was going to give them a proper burial as they deserved with our other animals which have passed. A few days later when I was at the store, they had more crabs and half of them were dead in their little Betta containers. After this, I emailed Wal-Mart and told them how they did not know how to care for these little creatures, and how PetSmart changed their policies regarding Fiddler crabs once it was brought to their attention how to truly care for them. I told my whole story to Wal-Mart in an email and at the end I said "I am trying to appeal to your heart; however, if I can't do that, I appeal to your bottom-line, since I know that is what matters these days. Every crab that dies is costing you money. So even if you don't care about these wonderful little creatures' lives, maybe you'll care about the money you are losing." I received a phone call from the manager and he told me their store would stop carrying the crabs and he would try to appeal to the Wal-Mart chain since they don't sell many of them. He said they receive them in the little containers and are told to display them like that. He said from now on, he would display a sign simply saying they could order the crabs if a customer wanted one. The next time I went to the store, I saw some crabs and was very mad. Two were dead and the one live one had very little water yet was extremely active and waving hello to me. I decided he needed a chance. I was hoping from this point, no more crabs would be seen at the store and guess what.....No more crabs have been seen at our Wal-Mart store!!! I am hoping that the manager kept his promise to try to contact the chain manager try to get them to stop selling them in other stores. But at least I know I made a difference at our store!!! Well, I think that is all for now. Once again, I appreciate all your help! Thank you for taking the time to read and respond to my emails. Hi Neale - I just had to tell you, even though I don't know you, you have given me so much super advice...I am super excited.....MY FEMALE MOLTED!!!!!!!!!!!!!!!!!!!!!!!!!!!!! All your recommendations must be helping cause I must be doing something right now! I am awaiting my order on the Eheim Aquaball, as well as a Rena Smartheater because the heater I have has been somewhat unreliable with the temps up and down rather than maintaining a steady temperature. When I pulled the chest up I could see that it was still stuck inside the old shell...it fell off him during his molt. This made me very sad as you can imagine. He did manage to grow back his one leg so now he has his eight legs back but now only his little claw. Will he be okay as far as getting around and such? I assume now I have to wait until his next molt for him to get his claw back? I will miss Mr. Waving Crabby. He used the big claw for holding some krill and such when eating so now I am afraid for him. One second concern of mine is that I've done, I think, two or three sand changes and WOW does that sand STINK!!!! I mean stink so much that you have to open up doors even though it is -20 degrees outside just to air the house out, plus light 20 candles, hold your nose, and try not to vomit stink. I thought it might be the carbon I was using in the filter media bags but I stopped using those and it's still happening. Do you think this would help keep the smell down and would it be appropriate for the fiddlers? http://www.livesand.com/ It mentions something about preventing "biofouling". I just don't know if it will work as far as the bacteria it contains as well as the "salt" content and if it would mess with the SG and salinity. <The bacteria in this sand may not adapt to brackish conditions, though in theory, they should be okay down to about SG 1.005. Would I bother? Otherwise, I found these http://www.onedersave.com/ecobio-pebbles.htm. Would these work better than the live sand at reducing the odor? I've been using reptile sand which is about $1/pound and the crabs seem to enjoy it the best as far as eating it and such; it does smell and get expensive...and it is a pain to wash every time!!! Since we keep the crabs in our main living room, the smell is the worst part so let me know if either of the above options would work better or what you would recommend as a suitable option for a sand replacement which is similar to sand but doesn't have the negative aspects associated with it. Thanks for your feedback on the live sand and the pebbles. I think you probably saved me some money there! I am understanding why the sand is smelling now and if it wasn't for you, I would have no clue!!! When I first had the initial crabs that passed away on me I used gravel and come to think of it, there was less smell. I went to sand because I heard crabs liked sand better. I wanted to do things right by these guys so I switched to sand. They seem to love their sand so much and I hate to take it away from them and just put a small bowl out. Tell me if this would work - put all gravel in the shape I have the sand in now, then put about an inch of the reptile sand over the gravel? This way there wouldn't be all sand and Mr. and Mrs. Crabby would have their sand like they are used to having. Would that cut down the odor or would the sand sneak down into the gravel and eventually create odors? I figure worst case scenario is that gravel is cheaper in the long run and if I have to change things more often, I am either changing the top level of sand which is less sand to change or I am changing the gravel and sand which is probably cheaper. It has two sponge type filtration plus a place for adding a substrate (carbon or whatnot). It is smaller and can be in less water and I can mount it horizontally or vertically....this was the challenge with the Eheim….I didn't have enough water for it to be submersed fully...as I only have about four to five inches of water. I appreciate all your input!!! While I had the crabs out of their aquarium and in their temporary set-up while I changed things, my mom checked on them and notice that the male had the female backed up against one wall with his arms around her. She told me they were mating. At first I didn't believe her but then after about 15 to 20 minutes or so of them being like this, I looked it up and started to believe her. So, now I ask you.....were they in fact mating? <Likely so. Males "straddle" the females, wrapping their legs around them. Did they have enough time to breed or will they actually breed now? The female didn't look any different and they aren't acting any differently now that they are back in their original tank. My assumption was they typically didn't mate, breed, spawn, have babies, etc. in captivity so I was very shocked by their behavior!!! Should there be anything for me to be looking for at this point? I thought this would be the last question I'd ever have to ask! Haha! Okay, well, no doubt they mated - as the since I put them back in their tank with the filter on, the female was staying out of the water - her favourite place to be. After your email, I turned the filter off and checked took out the hiding log and sure enough her belly is reddish and different looking. If I wanted to try to get her to have baby crabs what would be the best way to try for a possible positive reproduction. I know it is highly unlikely but is there anything I can do to help? As I said, I know highly unlikely but it is just so interesting to me!!!! I never thought this would happen because I read that even breeding in captivity was basically non-existent. Now that it happened, well, I'd like to see where it could go. Unless you tell me it would be a bad thing to happen - like I don't want to have 100 baby crabs or something. Can you tell me a bit more on their reproductive cycle and breeding, mating, what happens, how they have babies, etc? I tried to look it all up but there is so little info on Fiddler crab reproduction since it simply says in captivity it is unlikely so I just didn't think it would occur and am sooooooo confused now. So the suggestion would be to leave everything as is for right now....except get a sponge filter. 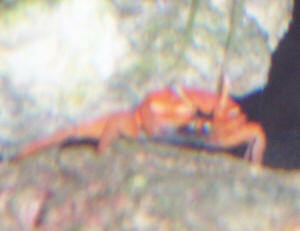 In a few days, Mrs. Crabby will come out from her hiding log and get rid of the eggs. Do I keep the eggs in the same aquarium as Mr. and Mrs. Crabby? Any special prep for the eggs to hatch? Will ALL the eggs hatch? Obviously I wouldn't mind having a few babies, but it scares me to have 100's of babies!! Once the eggs hatch to larvae - what is green water? Do you think it is likely that I could actually get some successful eggs to hatch and larvae to grow into crabs? What is the likelihood of this? later, I realized it was not going to happen. This is what took place. She went under the bridge where there wasn't complete water coverage. I turned off the filter. She sat under there for the longest time. Finally, she started to pick away with her claws at the front of her belly area. She would take a break and then start again. When she would stop, it would look almost like she would contract her belly and then she would start picking again. I thought perhaps she was cleaning off some sort of sack to help release the eggs; but I realized she wasn't in the water completely. After watching this for - as I said - three and a half hours....I realized she seemed to be "eating" away at the eggs. Could this be what she was doing? I finally gave up watching. The next day, it looked as though she still had eggs; however, she was acting more "normal" as in going in the water, climbing around, etc. Any ideas on what happened or what is going to happen? Did she eat some of her eggs? It looks like she still has some eggs, but is acting normal (yet sometimes still hiding out like she did for those few days) so what is going to happen to the leftover eggs? Is she just going to eat them all eventually? Will she release some of them at some point? Just wanted to let you know that update. Not sure what is going on with Mrs. Crabby though as far as the eggs. She's been in the water for the past few days hanging out. Hey Neale, one thing I forgot to mention is that I thought when males lost their big claw, and they molted, it would come back on the opposite side....however, my Mr. Crabby's big claw came back on the same side!! Is this because he lost the whole claw and joint during his last molt rather than just losing the "claw" part? We are hoping maybe him getting his big claw back will prevent them from "getting busy" again. It seemed like they only mated when he lost his claw. If it happens again, we may have to think of getting another female so it doesn't take so much energy out of her!!! So, after the whole thinking the female ate her eggs, it seemed like Mrs. Crabby was acting semi-normal....e.g. she was in the water, eating, hanging out by the heater, etc. I looked in on her a few times and it seemed to me it looked like she didn't have any more eggs left. I never saw any eggs anywhere in the tank or anything though. Anyway, she acted like this for a week or so and then for a few days I realized I hadn't seen her and had only been seeing the male hanging out in the water. Usually she stops hanging out in the water if the water isn't to her liking (not warm enough, dirty, etc). But the water seemed fine. I got worried so I searched around for her and lifted up the log on the land area and she was in there and went into the water. I immediately noticed - a dark red belly!!!! 1. Is it possible I was wrong for those few days and she somehow had the eggs but I couldn't see them? 2. Is it possible they mated AGAIN???? So soon???? 3. Is this going to be a recurring thing now???? 4. THIS IS CRAZY!!!!! - okay not a question - just frustration and confusion!! I thought, okay, breeding in captivity once - lucky chance and an interesting thing. But now twice? Is it good for her? Especially since she will never have viable hatchable eggs (and will probably eat them again)? Do crabs have "feelings" like maternal feelings, I mean, does this have an effect on her well-being? <Crabs have no maternal feelings at all; at least, not the ones that shed the larvae into the sea, leaving the larvae to drift away to pastures new. If this keeps happening, is there a way to stop it? I miss seeing my Mrs. Crabby!!! All she does is hide out in her log now!!! <It may well be that if there's a male in the tank, mating will happen, and there's not much you can do to stop that. Adding additional females could make life easier for all the females in the tank, but I doubt it'd stop them going into "berry" as it is called when crabs carry their eggs about. So, since the male molted, he was looking really light colored, then I realized, I hadn't given krill for a few days...amazingly, I gave some krill today and within hours, his shell was back to its dark color, his limbs back to dark and his big claw started to darken!!! It was so crazy that just the little bit of krill could do all that!! On another note, Mr. Crabby got busy with Mrs. Crabby AGAIN!!!!!!!!!!!!!!! Yes, she is carrying more eggs! It seems like it is only about two or three weeks in between...if that. I will look in and she is not carrying eggs and I will look in again and she is carrying eggs. It is ridiculous! Do you think getting another female would help? Will Mrs. Crabby be okay with a mistress? Will Mr. Crabby leave Mrs. Crabby alone and go with the mistress? Another thing is regarding how you mentioned that it was no surprise to you Mr. Crabby’s claw came back on the same side. I had read on numerous sites that it would regenerate on the opposite side, which is why I was surprised it was on the same side. I guess all the sites are wrong huh J? Also, between molts for Mr. Crabby, there was only one month between his molt where he lost his big claw and the one where he got it back...do you think he molted so quickly because he lost his big claw? Can Mrs. Crabby molt with all these eggs she is carrying seemingly non-stop? 1. 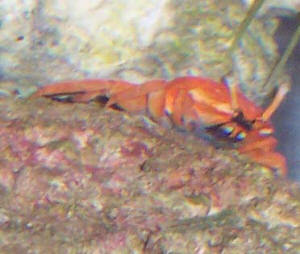 Did the krill really work that fast for Mr. Crabby in turning his shell color? 2. Can it be possible Mr. Crabby is mating with Mrs. Crabby this often? 3. Will another female stop Mr. Crabby from mating with Mrs. Crabby so often and have him mate with the other female and will Mrs. Crabby like/dislike the new female? 4. Is carrying eggs preventing Mrs. Crabby from molting? 5. Is it bad for Mrs. Crabby to be eating the eggs all the time - as she doesn’t seem to eat much else then? 6. Can this be bad for Mrs. Crabby’s health overall? Thanks for your response Neale! You said to make sure Mrs. Crabby eats well; the problem is, she doesn't eat at all while she has the eggs. I have noticed this batch of eggs seems to be hanging around longer and she seems more listless each day. It has me worried. The eggs don't seem to be going away as fast as the last few batches. She just is sitting under the heater. Today she wasn't moving about so I actually had to open up the tank and move the heater to see if she was living....that is how bad it is. Regarding the krill thing - Mr. Crabby's shell was light for about four days - almost translucent, even though I was feeding shrimp pellets and other crab pellets, etc. His big claw was also white to translucent. I was very worried about him as he was not darkening after his molt at all. After I did a tank cleaning and put the krill in, he ate some and it was like watching magic at work. Literally, his shell changed color right before our eyes. As we watched (my mom and I), we were amazed to see the color start to go into his big claw. The big claw is still translucent to white at the end but the transformation from molting, then three or four days of him being super light in color (his shell, his legs, etc. ), then giving the krill and seeing him transform to a dark shell and dark legs and semi-darkened big claw within less than an hour was simply crazy!!! As we watched, we literally saw the color go up his "arm" of his big claw and into his big claw. I was so mad I didn't give him krill after he molted!! Well, from everything we have discussed, it sounds like my tank needs another female (a mistress in the tank....Oooh). How do I introduce her into the tank - just plunk her in? I am assuming around my town I will be getting her from a tank where they keep them in a completely enclosed freshwater tank; will this matter how I introduce her to my land/slightly salty water tank? Does it matter as far as introducing her to the male first or the female first or just putting her in with both of them at once? Should I look for a small/younger female or a slightly older female - I highly doubt I will have much say in this as fiddlers are few and far between around here...but if I have a choice, which should I choose? Thanks so much again Neale. You are so amazing!!! Thanks for not getting bored with my questions!!! Well, the update is that I got two new females, one is about the size of my current female and the other is just a bit smaller. I tried separating out my female but she seemed miserable being by herself. I decided I would try them all together and see if the male leaves her alone. We'll see how things turn out. Well - Mrs. Crabby didn't have eggs so I figured it was a good time to add the new gals. Guess what - Mr. Crabby got busy with Mrs. Crabby last night and she has eggs again!!! Grrrrrrrrrrrrrrrrrrrrrrrrrrrrrrrrrrrrr. Since Mrs. Crabby didn't like being by herself, would be it a good idea to put Mrs. Crabby with the smaller female in another tank for company? This way Mr. Crabby would have the bigger female (who is actually bigger than Mrs. Crabby), and Mrs. Crabby would have someone as well. It is just an idea I had because I know both Mr. and Mrs. are used to having company. Let me know your thoughts. One cute story to share with you is that when I had all three females in, and then added the Mr. he acted hilarious! He first went into the water but then realized there were more females and ran up onto the land and into the cave. For about 5-10 minutes, he proceeded to "pace" within the cave, outside the cave, peek from one end outside of it, go back in, come out the other side and peek out, go back in, pace a bit within the cave, etc. It reminded me of a male trying to figure out what to do when he wants to approach a new girl but not sure how to do it. My mom and I were laughing so hard the way he acted. He almost came out a few times but decided not to. Finally, when he decided to come out of his cave, he slowly came down, and approached the larger female. She didn't seem to mind. He moved a big closer and he waved his large claw in small motions really quickly. As she moved away, he followed slowly but didn't make too many motions, just followed her. At one point, he did check out the smaller female but she scurried from him and he left her alone and kept his attentions on the larger female...until he decided at some point to go "knock up" the Mrs.!!!! Anyway, I just wanted to share how cute the Mr. was with the new females. I also wanted to ask about what to do regarding the separation and if putting another female with the Mrs. would be an appropriate substitute/company. P.S. Glad you are not bored with my emails!!! Mr. Crabby has been busy...he not only knocked up Mrs. Crabby that first night...but now he also knocked up the smaller new crabby. He hasn't done anything with the bigger female as of yet. Maybe she is too intimidating or won't let him - not sure. So my tank has two females with eggs, the male, and the larger female. I am getting a second tank. I know you suggested giving Mrs. Crabby a break. I may still do that. I am glad that the water conditions and such are so great for mating; but geesh, I had no clue that Mr. Crabby would be such a, well, horny little guy. He wasn't this way at all until he mated with Mrs. Crabby the first time. Now it seems that is all he is doing and wants to do. It was so much easier and fun when there was no mating going on. Mr. Crabby sits on his chest and waves his claw nearly all day long - must come down to mate at some point. The girls with eggs hide out in the cave or by the filter. The larger female is usually under the heater or if approached by the male (or me) runs away. One question I have for you is about color of shells. When I got the two new girls, both were very "orange-ish" brown in color, vs. my two were very dark, deep brown. Is this due to the salinity of the water? Is it due to diet? Is it due to molting/being close to or not close to molting? Again, thanks for listening and your advice!! Mr. Crabby is definitely happy with his "harem". All three girls are constantly with eggs now, with the exception of when they dispose or eat them for a day. I feel bad that they are always with eggs - is this something they are "okay" with? It doesn't seem so, as it seems they try to stay away from him by huddling under the heater or crouching by the filter. They are very inactive overall and seem to stay where Mr. Crabby can't get to them. This makes them stay virtually on top of one another. When I cleaned the tank, I put the three girls into a separate tank and they were relatively active for a while and then they played Queen of the castle and tried to get the top of the decoration I put into the separate tank. Since I didn't want fighting to ensue, I took that decoration out and put one in without a definitive "top" to it. This ended the fighting. While the three girls were by themselves, Mr. Crabby was by himself in a separate tank and he basically his in a small corner behind a small rock dish area the whole time. Let's just say he was VERY happy to be reunited with his girls after 3-4 hours. He waved that claw so fast and stood on his tippy tippy-toes on the heater for hours. Since the tank cleaning, I put the filter closer to the wall and to the bottom of the tank, thus taking away the space where the girls were huddling and hiding...I am not sure if this was a good idea or bad one. I would like them to be more active within the tank, but I don't want them to feel they have no place to go and hide from Mr. Crabby. I needed to do some inventing. I bought some Plexiglas, silicone, gravel, and sand....took some measurements....got the Plexiglas cut and then built a sort of "invisible" platform in the water. It consists of a bottom, back, top, on longer side, a middle piece for structure, and then a ramp piece. On the ramp, I siliconed a bunch of gravel down and I siliconed all the other pieces together. Once finished, I put sand on the top piece, as well as the ramp (the gravel was to hold the sand on), and then a bit of sand around the bottom of the tank. I added some more hiding areas into the newly created spaces from the Plexiglas, and then filled it all with water. Basically my tank was being half used up by a sand pile which was rotting away weekly. Now, I created a situation where the whole bottom tank is filled with water but the crabbies can escape (just like always) out of the water by going up the ramp and to the platform area. They really didn't lose any land space, but they gained a ton of water space. They seem to like it quite a bit. Mr. Crabby took a break for a while from getting busy with the girls - I think it was because he had to molt. He successfully molted and his claw got quite a bit larger and he was very cranky for some time prior to and after his molting. After he got over that, he mated with two of the females....grrrrrrr. I have also found some pellets that don't seem to make the water as dirty. They have some seaweed component as well as a shrimp component. I also feed them frozen krill (and some freeze-dried krill) at least once a week. I usually have to turn the filter off otherwise it all heads towards the filter immediately. They all love their krill!!!! Sometimes one of them will get goofy and go around trying to collect all the krill from around the tank - as I try to spread it around so each can have access to some. I found a liquid calcium supplement to add to the water and have been doing that. Is it something you recommend? What about an iodine supplement for the water? Would you suggest adding that as well? I finally did find a filter I didn't mind - it is actually a turtle filter....from ZooMed http://www.amazon.com/Zoo-Med-Turtle-Submersible-Filter/dp/B001F95UA0/ref=sr_1_5?ie=UTF8&qid=1369634975&sr=8-5&keywords=zoomed+turtle+filter . It seems to do a good job; I just have to make sure I keep the water level high enough so it is quiet enough. With what I built from Plexiglas I made a small error on measurement for the height, due to where the water level needs to be with the filter, so the water washes away some of the sand on the top level, so I am going to purchase some very thin Plexiglas to add to the bottom to raise it up slightly. I am sure I will never stop thinking of new ways to come up with fixes for things. I just hope that this thing I made will help with the sand stink problem now, since the sand is only a thin layer around the tank. We'll see how it goes after a few weeks. At least cleaning will be easier since all I have to do is empty the water, clean off the Plexiglas thing, and clean the tank and put new sand. There won't be those huge piles of stinky rotten sand like there was before!!! It really was getting bad!!!! Anyway, I just wanted to update you since I know it has been quite some time. I figure I would let you know the crabbies are all still living!!! YAY! As far as molts go, the male only molted once since the last time when he got his big claw back. Mrs. Crabby hasn't molted for quite a while as far as I know. And the two new mistresses....despite their size difference...both molted on the same day!!!! It was quite surprising. Hope all is well and I will keep you updated. If you have any suggestions for me with anything I have said or any concerns for what I have created in my tank, let me know. If I have any questions, I know where to come!!! Since my last email, none of the girls have had eggs. As of my last email, one had them and once she got rid of them, that was it - no more eggs. It is very odd. The male has been mainly hanging out in his cave and the girls in the water area. Do the girls go through some sort of cycle where they are able to carry eggs for a certain amount of time and then that is over? Although it would seem odd since all three were carrying at the same time and now none are. Anyway, the good news is that FINALLY, my Mrs. Crabby was able to molt!!! It had been since beginning of January that she molted the first time and she hadn't since then because she was carrying eggs almost constantly and now finally I saw a molted shell! I was so happy for her. I swear she almost doubled in size. She is very light in color and staying in the chest where she molted. She was also acting quite odd and disoriented. I am keeping an eye on her and just making sure I get food in there and that the others are leaving her alone for the most part. She is quite the tough gal...and she just seems to need to get used to her new long limbs. I have some bad news...one of my crabbies is no longer with us. We called her Ms. Escape Artist and, well, she finally escaped off this Earth four days ago. I always do a "count" in the morning and evening to make sure all four crabbies are accounted for and the other day I was rushed in the morning and in the evening, there were only three. I'll tell you what happened, but it also leads me to a few questions for you. Ms. Escape Artist was one of the two mistresses I purchased for Mr. Crabbie. She was the larger of the two and typically spent her time away from the others. She had tried to escape at least five or six times that I can think of - by crawling up the cords of the heater, when I was cleaning their tank she tried to crawl out the temporary tank a few times (made it out once), crawling up the higher log area when the tank top was off (made it out once)....so I was always careful of how I arranged the tank heater and filter cords. I knew she couldn't crawl up and out because of the lid. I knew she couldn't crawl up and fall down and out because it was enclosed. However, I knew if she fell into the enclosed area for any length of time, obviously she could dry out, get stressed, etc. so I always kept the cords a certain way. With my last cleaning, I took the entire tank off the table and in doing so, must have shifted something. A few days after the cleaning, I fed the crabbies, and three of them popped out of the one ornament to get food. I found it odd ALL three were in the one place together because they normally were in their own areas. Anyway, that night when I did my "count", I counted all three still in the one ornament?!?! And then could not find "four". So I began to tear apart the whole aquarium, taking out ornament by ornament trying to find "four". Finally the tank was nearly empty and I realized "four" was not in the tank. My heart sunk as I opened up the lid and looked down. Sure enough....there she was...belly up in the bottom of the area. I reached in and took her out and tried to get some of the "salt water" on her but to no avail. She must have crawled up the cords the previous evening because with the plastic container, had she done it during the day, we would have heard her crawling around in there. Of course, I was completely heartbroken. It has taken me this many days to email you about the situation. This all has led me to some questions about the death of crabs. 1. Obviously the other three knew something was going on because they were all huddled together in the ornament furthest from the back. Do crabs give off some "odor" or something when they have died? I know when my first crab died, the second died within a day or so and when I had the group of crabs, they all huddled together and all died within 24 hours of each other (those lost limbs besides). So do they somehow know when one is sick or dead and stay away? (also as soon as Ms. Escape Artist was removed, the other three came out of their one area and resumed going separate ways). 2. Do crabs mourn one another? Ever since the passing of the one crab.....the other crab I purchased with her has basically stayed in one spot while the other two, Mr. and Mrs. Crabby, have gone along and done their business as always. The little Baby has sat on top of this little ornament towards the back where the other crab usually was. Is there some bond between Mr. and Mrs....and then between the two mistresses which were purchased together? The Mr. and Mrs. don’t seem to care a bit that one is missing; while Baby is in the same spot every time I look in on them. Only if I reach in will she move off her perch. She wasn’t like this before...normally she hung out by the heater, or in the other ornaments, etc. This is different behavior for her. 3. What are the odds Baby will die now that her “partner” is gone? Is there anything I can do to help her with what she is doing so she doesn’t just sit on her one spot? 4. Mr. Crabby didn’t usually mate with Baby, as he mated with Mrs. Crabby and the other larger female most often; so I assume, he will be back to mating with Mrs. Crabby again a lot. Should I get another female? I am scared to introduce a single strange female; however, maybe it would be better since if Baby is mourning her “partner”, maybe they shouldn’t be bought in pairs? Well, I know I am still mourning my little Escape Artist. I know she wasn’t truly happy in the tank as she was always trying to be away from the others and always trying to escape.....but it is still so difficult as I was doing so well with them!!! Mrs. Crabby is with eggs again of course. They seem to love my Plexiglas creation. I’ve taken and attached a picture for you. It has given them a lot of water, which they love; but they also have the land area under the log if they want to be on land. In reality, they didn’t actually lose a lot of land space because before, half the tank was full of gravel/sand/etc. and then they had the little land area on top....which is what they have now. All they gained is a lot more water space and more ornaments to hide in from each other J. So, I guess let me know your thoughts on things. You’ve been so much help to me you can’t even know! Thank you so much for the information. So, from what it sounds like, I am attributing human traits to the crabs (a bad tendency with animal lovers....). Overall, there haven't been any changes with the water salinity, humidity, feedings, water temperature, etc. That is why I am worried about the behavior of the Baby. It is highly unusual for her. You mentioned elephants recognizing when one of their own has died, but I have seen squirrels and dogs run out into the street to try to arouse a dead mate (or pal). Not too long ago there was a video of the one dog sitting by another dog who had been hit and killed. The dog sat for hours trying arouse or pull the other dog out of the middle of the road. I believe finally some people had to stop and pick up both dogs. I've seen two squirrels playing, one get hit and the other go out into the middle of the road to try to nudge its mate or pal back to life at the risk of its own. I guess for those reasons it just seemed the behavior of the other three seemed odd that they were all huddled into the one ornament and as soon as I found the one and removed her....the others dissipated and went along with their business. So for me it seemed like putting two and two together would be that somehow they knew or could smell and were staying away. I know they certainly develop an odor within 24-48 hours of being dead!!!!. Thanks for the article. I found it online and downloaded the pages relevant to the Fiddlers. You can be sure I will read it thoroughly!!!! In the meantime, I am going to go give some food to them to see if I can arouse Baby….. I recently found some Fiddler Crabs at the local pet store. They were, of course, being kept in a freshwater tank with no way to get air. I did not purchase any, but I did start doing research. I will be working at a science center this summer, and I think that a Salt-Marsh Ecosystem display would be really neat. It would consist of approx. 70 gal. long tank with a fine sand substrate. Do you think that four inches of sand would be good or more? Should the water be kept at more 1.000 or 1.015? Is there a way to purchase the grasses and other plants that grow naturally in the marsh not online? What are some of the most common species of plant that would grow in the region? What types of rock would be best? Limestone, Granite, Sandstone, Lava Rock? Drift Wood is okay or not? The tank would have a small section of brackish water on either side. What foods would be best to feed them? Would heat lamps be good for keeping the entire thing (open air) warm or should a heater be used? Would an aerator be enough for the small ponds of brackish water? My daughter brought home a fiddler crab from a school experiment. I felt so bad for all of the creatures that were purchased for the classroom (frogs, crabs, millipedes, etc). There was a very high mortality rate. So rather than buy what were being passed as hermit crab habitats at the local pet store, we bought a 10 gallon ZooMed terrarium. while at said local pet store I saw another fiddler crab in a freshwater goldfish bowl. Having remembered a post from your website I told them that they weren't compatible. They said that you didn't know what you were talking about because the "little guy was doing fine". So I bought him as well. We followed all the directions to the letter. The two (male and female) were happy as...well clams. Now they don't seem as happy now as they did before. They stay in their burrow all the time. They don't seem to be eating. I'm getting concerned. We currently have a freshwater bowl, a brackish water bowl and the rest is aquarium sand mixed with hermit crab substrate. I'm wondering if I've gone too far the other way and they're not getting enough water. The tank has a 30% humidity level -- which I see now is too low. So perhaps I need to either mist or pour brackish water into the tank itself. It has a full screen top on it. I have an under tank heater that I've attached to the back of the terrarium. I just don't want to make things worse for the poor little guys. I was also thinking about partially covering the top with some Plexiglas but not sure. I got a butterfly fish (freshwater) the other day . recently I noticed a group of bubbles on a bamboo leaf ,the next day there were tons in my tank (bamboo plants and surface) what is going on? should I get him/her a mate? I had a 2 foot Koi in my pond (I live in MD).he started out orange and white but over 3-4 years he changed to all white to orangish pink to sort of transparent to white with a orangish pink head is this normal? with 1-2 fiddler crabs . is it okay to put a small fish in the water half? Like a Betta or something? Hey thanks so much for the speedy response to my brackish tank question! I have a new dilemma. I was in the process of changing my freshwater tank slowly to brackish, following the instructions that someone on your site gave me about slow water changes, when my fiddler crab decided to molt. At least I think he did. He is down in the water upside-down and not moving. He was like that when I got home from work and has remained that way for at least an hour. Two of his legs are gone and part of his large claw is missing. He's almost all white and there is a white film on his belly and big claw. The rest of him looks pretty solid. I read that this could be his exoskeleton and he might be hiding somewhere but is there any way I can tell for sure? Was the water chemistry just too hard on him and he died mid molt? He looks so sad just laying there. I save a fiddler crab at work, the bigger one took all of but one of his legs off. he has the feeder claw and that's it. I have him in a small bowl at the moment with gravel in it. Can you give me some suggestion to help "Little Man"(his name) out? I have tried to research this situation and have not come up with any solutions. and how many I could have in a 20 gallon long? I'm also wondering if red claws are more shy than fiddlers bc I see my fiddler alot <No such word> more. So I'm looking at setting up a fish tank, and I was wondering if it was ok to keep freshwater fiddler crabs and goldfish together. Also any advice on this would be wonderful. Thank you so much. I would have hated to set my tank up and have one or the other die. Hello, I am sending this email as a reply to facilitate "the whole story" being together in your wonderful archives, but our last correspondence about this Fiddler crab was a couple years and several months ago. I was down to a male and a female left in October 2008, and around December 2008 the male died after sitting in a little tree for two days. Due to some bad personal circumstances, I did not buy more Fiddler crabs to go with the female (I had been a bit discouraged / surprised by the male pulling the legs of the other female who was carrying his eggs earlier too, despite having access to proteinaceous foods). So this last female Fiddler has been living with me since the summer of 2008, and she has been active and molting well and so on until December 24, 2010 when she molted out in the open (versus her standard area in the coconut house) and she did not eat any of the molt. She looked larger after the molt and her appendages and color all looked great. She will not eat since then (makes no poop, so it is certain) and just wants to sit in the tree. She responds as far as putting up her claws and legs and hiding behind the tree. Every day since then I have expected to find that she has passed on, but she is still here and I was floored to find another molt out in the open yesterday (she still has all of her appendages and normal color, but I can't tell her exact size because she is hiding). We had discussed earlier that Instant Ocean in her brackish water should be supplying the iodine she needs, and if it is "just her time" she is certainly going much slower than the other two. I would appreciate any thoughts or comments about this situation. Just wanted to say that the Fiddler crab died at the end of March after not eating since at least Christmas (she didn't make any poop either, so was definitely not eating). I read about acclimating ghost shrimp to her brackish water and added some and it was just the thing to get her moving about the tank., I was amazed at the difference. She tried to scissor them at times, and one time she was even letting them clean a tiny bit of algae that had grown on her back. How she was able to do all this on an empty stomach, I will never understand. The night before she died she was riding around on a floating plant trying to pinch the shrimp that were eating the food that she wouldn't eat. I had her for at least two years and eight months. I have since raised the water level in the tank and am enjoying the ghost shrimp. Well, I did have a proper Fiddler environment, with brackish water, and have lovely videos and photos of tunnel digging in the sand, etc. I even had Fiddler zoea though they didn't make it past five days on phytoplankton and zooplankton. That was kind of my point, that people shouldn't buy them and drop them into deep freshwater tanks. Besides being cruel, it is a waste of money - they should get a crab ornament instead that won't disintegrate. Hello, I was wondering if ghost shrimp, Amano (algae eating) shrimp and fiddler crabs would be compatible with each other. I know fiddler crabs require brackish water, but what salinity can the shrimp tolerate? If they get along, what SG would be best for all species? They would be in a 30 gallon tank. I would provide sufficient habitat/hiding spots for all species including water plants for the shrimp and adequate land for the fiddler crabs. Thanks. hi I am, Godffrey Nazaire conducting a thesis entitle "Macroinvertebrate diversity in mangrove swamp of Barrio Ilang, Davao City" would like to ask from you if you can help me identifying this species of fiddler crab attached here. <Hello Godffrey. May I share some tips with you about asking help from academics. First, start by checking that they work in your field. My own PhD is in geology, and while I help out at WetWebMedia with regard to freshwater and brackish water fishkeeping, I am not a fiddler crab systematist. Next, be sure to start your message with a personal, relevant greeting. Asking someone to identify an organism -- in other words, asking them to spend their time doing your work -- is a significant favour. Many academics are happy to help, and thoroughly enjoying talking with other people interested in their aspect of science. But most academics will expect a personalised message. Perhaps mention how much you enjoyed reading one of their papers, or that you are particularly interested in some bit of science they are working on. If another academic mentioned their name, then say so. Make it clear that you know them and their science, and didn't just find their name on Google. Finally, don't send the same message to a bunch of people at the same time. Each message should be unique. By looking at the "To:" field on your message, I can see you sent it to at least five different people. That doesn't make me, the reader, feel special. Here at WetWebMedia we are all volunteers, and we each spend anything up to an hour a day answering e-mails from people with sick fish, plants and invertebrates. I'm sure the other academics you wrote to also have pressures on their time. It is therefore very important you make the recipient of your message *want* to reply, rather than make them annoyed. I'm taking the time writing this all out precisely because I was once a BSc student and a PhD student, and I certainly want you to enjoy your scientific education and get the most from your interactions with other scientists. So I hope you take this reply for what it is, advice that should make your communications with other scientists much more successful. ..even if they don't have the oversize claw... maybe they're female. I sent you a picture, maybe you can help me with this identification. I don't want to give bad information to my customers.